Bionym's Nymi smartwatch promises to safeguard your Bitcoins, data. Can This Wristband Secure Your Data, Be Your Bitcoin Wallet, and Do Fitness Tracking All at Once? Nymi is a smart wristband that packs in a bitcoin wallet, personalized security based on the user’s heartbeat, and biometric readings for use like a fitness band. As with other private data, you don’t want your bitcoins spilling out all over the Internet. You have to keep them safe in your very own bitcoin wallet. And where should that wallet be? It might not make sense to put it in your pocket, but Bionym, a Canadian company that makes wearables, wants to put it on your wrist. 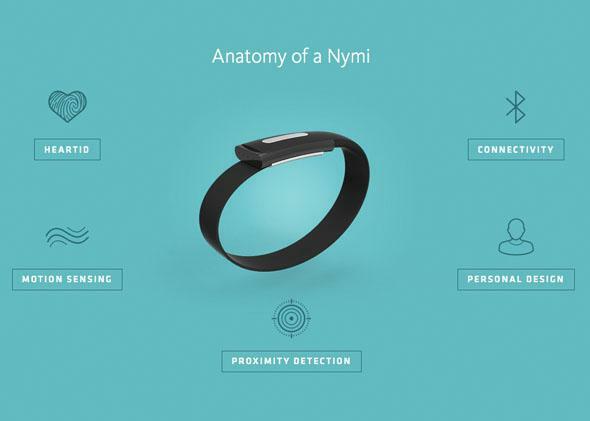 Bionym’s “Nymi” smart wristband uses an electrocardiogram (ECG) sensor to scan the unique qualities of your heartbeat and process them into a sort of fingerprint. Your heartbeat info is stored on Nymi’s servers and is used to verify your identity, so if someone else puts your wristband on, they’ll be locked out of the services you have linked to Nymi. The bitcoin wallet is physically stored on the wristband, though, so it constantly authenticates with the user’s heartbeat. It just takes one tap to activate the wallet, and the encryption key can be backed up on another device in case the wristband gets lost. People don’t know where their Bitcoin funds are stored, and who can access them. The Nymi’s wallet application makes the answer clear: the wallet is physically stored on the Nymi. The Nymi’s multi-factor system, including its ECG biometric, ensures secure Bitcoin storage tied to the rightful owner. Nymi also collects biometric data and can sync with fitness apps, or be used as an authenticator beyond the bitcoin wallet. Bionym’s goal is to eventually use the tech to faciliate easy check-ins at airports or hotels, and generally utilize it as an easy way to verify people’s identitites. Sounds great, right? But critics worry that the technology is exploitable. It’s still being tested, like in this paper, which shows how scientists at India’s JIS College of Engineering used ECG to turn human heartbeats into an 8-bit “biometric hash” for encryption. Though much of the research is promising, it’s unclear whether the technology is ready for consumer applications. You know that cliche about wearing your heart on your sleeve? Maybe you should also be careful about wearing it on your wrist if you value your bitcoins. On Feb. 11, Future Tense—a partnership of Slate, the New America Foundation, and Arizona State University—will host an event on cryptocurrencies at the New America office in Washington, D.C. For more information and to watch the webcast, visit the New America website.